Steve Pearce's RBI double in the top of the first inning drove in Andrew Benintendi with the game's only run as the Red Sox beat the Tigers 1-0 at Comerica Park Friday night. David Price (pictured) tossed 6.1 shutout innings to earn his 11th win of the year. He scattered four hits, walked one and struck out five. 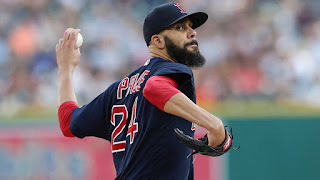 Price's toughest spot was a bases loaded, no out bottom of the fourth which he managed to get himself out of with a pair of fly balls and a strikeout. Craig Kimbrel worked the ninth inning for his 31st save of the season. Benintendi and Pearce each had two hits for Boston in an otherwise quiet night at the plate; the team had only six hits in total. Combined with the Yankees losing to the Mets in the Bronx, the Red Sox now have a 5.5 game lead in the American League East (four in the loss column).